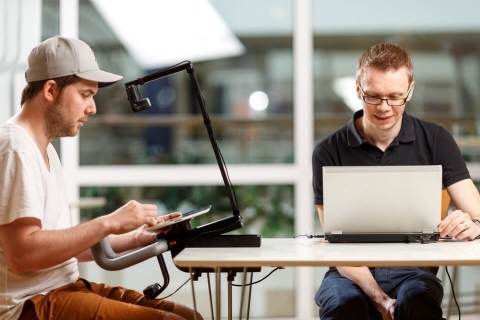 The Tobii Mobile Device Stand is designed to be used with a Tobii Pro Nano, X2-30, X2-60, X3-120 Eye Trackers and a Windows computer running Tobii Pro Lab or Tobii pro Studio Software. The Mobile Device Testing solution enables collection of eye tracking data during an interaction with smartphones, tablet computers and other devices or objects of similar size such as books or brochures. The tested device (e.g. smartphone or tablet) is firmly attached to a supplied holder. The stand is delivered with all necessary equipment for eight different configurations optimized for different devices and setups. It includes an adjustable scene camera (that points at and films the mobile device) to enable capturing of user actions and the user interface. Eye tracking data will be superimposed on images and video captured with the scene camera in the analysis software - Tobii Pro Lab or Tobii Pro Studio. 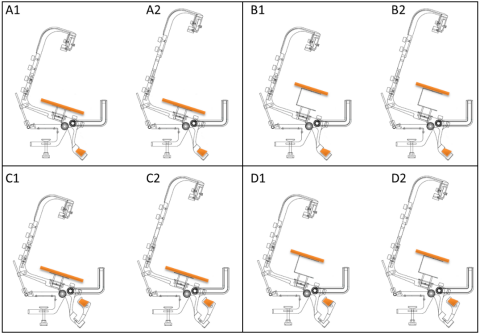 To meet the needs of different device types, participant height and study objectives, the Mobile Device Stand can be assembled to create eight different configurations (A1, A2, B1, B2, C1, C2, D1 and D2). Any of these configurations can be optimal for a specific testing scenario. In the following instructions, configuration A2 will be assembled. In standard scenarios, configurations A1 and A2 are recommended for most tablets and smart phones. Make sure you have all the pieces required to assemble the Mobile Device Stand. Slide the main body onto the table top. Make sure it slides on as far as possible so that the stand sits tightly. Firmly tighten the clamp screws underneath the table top. Slide the long scene camera rod into place for setup A2. There are two scene camera rods available: one longer that positions the scene camera farther away (for setups A/B/C/D-2) and one shorter that positions the scene camera closer to the tested device (for setups A/B/C/D–1). Use two of the larger (M6x20) hand screws to fasten the scene camera rod to the main body on the Mobile Device Stand. Slide the scene camera holder (with Logitech webcam) onto the scene camera rod. Use the two remaining larger (M6x20) hand screws to fasten the scene camera holder to the rod. Tie the scene camera USB cable tightly to the stand use pieces of Velcro all the way down to the table along the scene camera rod. Slide the guide bars into the holes on the side of the Mobile Device Stand main body, and lock them into place by fastening the smaller (M6x15) hand screws. The purpose of the guide bars is to make sure that the participants’ arms do not occlude the eye tracker’s view of the participants’ eyes. The participants’ arms should be on the outside of the guide bars at all times. Carefully push the flat holder straight into the hole in the center of the main body, until it snaps into place. Make sure that the holder can be turned both clockwise and counter-clockwise, and that it stays at 90 degree angles. There are two different mobile device holders available: one flat holder that is suitable for larger smartphones and tablets (for configurations A1, A2, C1 and, C2) and one bracket holder that allows the participant to hold smaller mobile devices more naturally and closer to the body (for configurations B1, B2, D1 and, D2). To make sure the eye tracker stays in place and avoid damage should someone pull the USB cable, fasten the USB cable with a piece of Velcro to the main body. Next you need to Configuring the eye tracker using the Eye Tracker Manager and Pro Studio or Pro Lab to work with the mobile device stand.